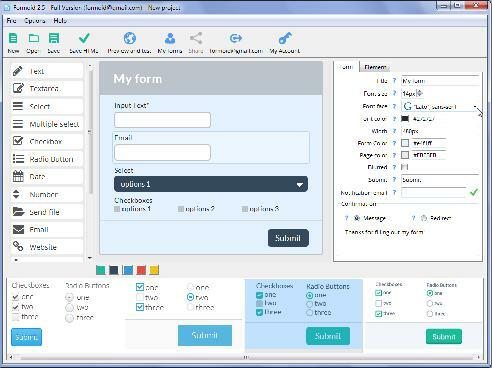 Formoid is a free desktop app that helps you easily create web form design, contact forms, html5 form, jquery mobile form and more in a few seconds without writing a single line of code. Create killer online forms in just a few clicks. Formoid has the best comparison - hope you can do better than that. asking me how to develop their <keyw id=1/> themselves. I’ve been working with Acrobat, LivecycleDesigner, and FormsCentral. Formoid php contact form has the best comparison with Formscentral, but I hope you can do better than that. •When a file has been chosen to upload, give a confirmation of the chosen file. By text or by thumbnail. Or both. •Where is the data stored? Would this work on a database on your server, or even beter: can I configure it to work on my own server? There you would beat FormsCentral. •Give me some more design tools: not one font size, but more. Give me color libraries, templates, more fonts, gradients, even pictures to place in the background. •I would love fields to do some calculations for me (FormCentral doesn’t). •I hope there’s going to be form logic, where certain fields are left out because of certain given answers in other fields. Keep up the good work. It looks promising! We appreciate your suggestions and will send them to our developer team.